ABOUT Raymond D. Adamcik M.D. Raymond Adamcik, M.D is the local world leader in anti-aging and bariatric (weight control) medicine. He is the founder of Florida anti-aging Center which is in Satellite Beach, Florida. He has treated over 50,000 patients in his 37 years of practice. In 2009 his passion for anti-aging medicine began when he developed disabling fatigue. Conventional physicians and specialists were unable to help him. Later that year he attended hIS first anti-aging conference that changed his life! He was able to cure his own condition by optimizing his hormones and discovered them to be the root of many illnesses he was treating. He decided to share his treatments with the next 10,000 patients and they too saw amazing results! Their results inspired him to become certified in Anti-Aging by A4M in 2014, and in that same year he was certified as a BioTE provider (hormone pellet implants). To extend his expertise, he has attended international anti-aging conferences as far away as Thailand and Belgium. 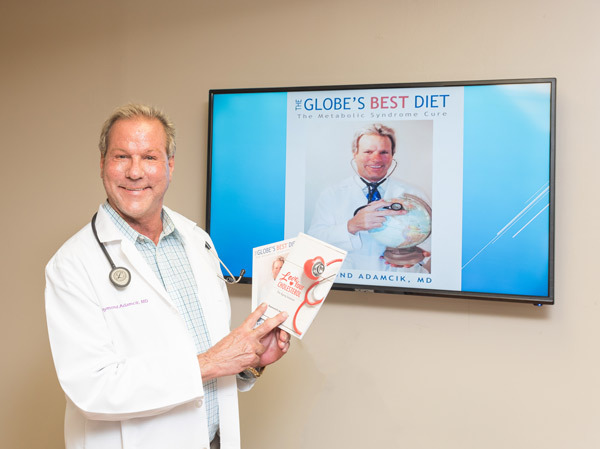 He has also attended advanced conferences on Bariatrics (weight control) and has learned how to turn on the “metabolic switch” for many patients. Dr. Adamcik recently published his second book “Love Your Cholesterol- The Aging Solution”. The book reveals some of his anti-aging secrets from 20 years of independent scientific research. His first book “The Globe’s Best Diet “was published in 2007. In that book , he called out the medical profession for their dangerous recommendations of the low fat diet which was devastating to him and his patients’ health. Attended various anti-aging and Bariatric (weight loss) conferences worldwide Including A4m Bangkok 2013, Las Vegas 2014, Orlando 2015, Fort Lauderdale 2016, Obesity Medicine – 2015, AMMG (age management medicine group) Orlando – 2015, Pro-aging conference Brussels Belgium -2017, and thousands of hour of independent research.